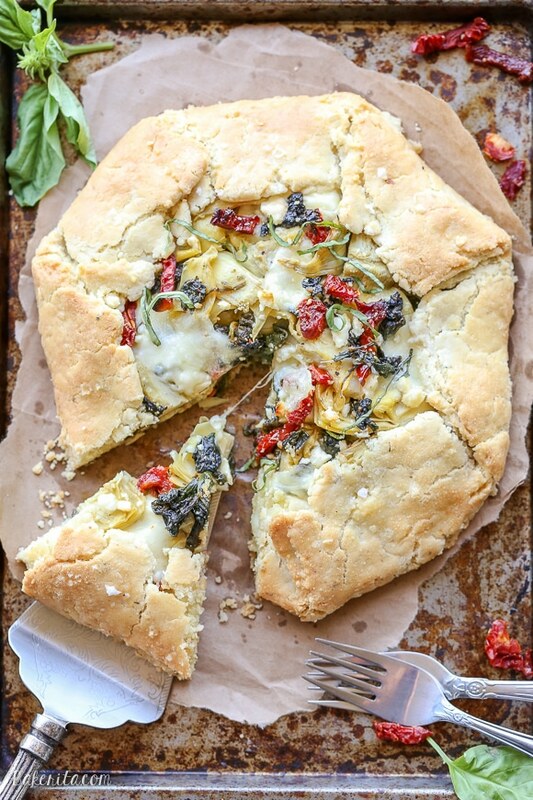 This Spinach + Artichoke Mediterranean Galette has sun-dried tomatoes, artichoke hearts, feta cheese, and gooey mozzarella tucked into a flaky gluten-free and grain-free crust. Pair with a side salad for the perfect lunch or dinner. I’ve started to create a bucket list of food projects to take on in the next couple months. They’ve all been on the brain for a while, and this summer I’m determined to make them all actually happen. Croissants took about four years to get checked off my food project bucket list and it will definitely not take that long before the next thing on the list gets a big old check mark next to it. So what’s coming up? Homemade sourdough made with a starter I made all by myself, homemade kombucha (I’m a little freaked out about the SCOBY though), from-scratch mozzarella, and homemade seasoning salts (I’m kind of a salt dork). They’re all coming soon in my kitchen…as soon as I find an apartment, that is. Let me know if you want them to be documented on the blog! Another bucket list item is getting crossed off today too, but could also use more development on my site…depending on how this goes over. Savory baking. How do you feel about it? Because I love it. I’m always playing with sweets in the kitchen, so getting to pull in some of my savory favorites like artichokes and sun-dried tomatoes and cheeeeese (in multiple forms!!) was too much fun. I’ve been wanting to dabble more with adding savory ingredients to my baked goods, and after starting a love affair with galettes with this Chocolate Strawberry Galette, I figured it was the perfect format to try something a little more savory. And if I do say so myself…I did a pretty damn good job. The gluten-free and grain-free crust is a twist on the one I used for my previous galette, but without the sugar, plus a little extra salt and some oregano to make it more savory. The crust turns out beyond flaky and delicious, thanks to the cold butter cut into the dough – I could hardly believe it was gluten-free. The filling was inspired by my adoration for Mediterranean food, and my excitement about my upcoming vacation…a cruise through Europe with my family! I’m going with my mom’s whole side of the family, and we’re starting in Athens, Greece. I have been dying to go to Greece for forever and now that it’s less than a week away, I can hardly contain my excitement. In anticipation for all the Greek food I’ll be devouring, I let my mind take a quick vacation through the Greek Isles to inspire the filling of this galette. I started with sautéed spinach and marinated artichoke hearts, added garlic and lemon and spices for extra flavor, and rounded it out with some sun-dried tomatoes. Fresh mozzarella added some extra gooey cheesiness, while the feta added a salty bite at the end. Pure perfection. The galette is bright, fresh and absolutely delicious. The filling, tucked into the golden flaky crust, is held together by the gooey, melty cheese and a bit of fresh basil sprinkled on top rounds it out perfectly. It makes a perfect vegetarian lunch or dinner, especially with a salad served alongside. It also reheats wonderfully in the toaster oven. So, savory baked goods – where do you stand?! Give this galette a try and let me know what you think :D enjoy!! Combine the almond flour, tapioca flour, salt and butter in a food processor, or use a pastry blender in a bowl. Pulse or blend until the texture of coarse meal. Add 1 egg and pulse/mix again until dough comes together. Turn out the dough onto a piece of plastic wrap and refrigerate for at least 1 hour or up to overnight. When ready to bake, preheat oven to 375°F. Heat 2 tablespoons of olive oil in a medium sauté pan and add the garlic. Cook for one minute until fragrant, and then add the spinach and cook until wilted. Remove from heat and stir in the artichoke hearts, lemon zest, salt, pepper, oregano, and sun-dried tomatoes. Roll the dough out between two pieces of parchment paper into a circle. You want it thick enough to be able to hold the filling and fold up the sides. Place the filling in the middle of the circle leaving about 2 inches around the edge empty. Top with chunks of fresh mozzarella and sprinkle the feta evenly over the filling. Gently fold the sides up, creasing the dough together with your fingers as you go. I used the parchment to help fold up the dough so it didn’t break at all. Beat the remaining egg with a splash of water in a small bowl. Brush the outside edges of the galette with the egg wash. Let dry for two minutes, and brush one more time. Sprinkle the crust with flaky sea salt. Transfer the parchment with the galette to the baking sheet and bake for 35-40 minutes until the edges are golden brown and the cheese is bubbly. Remove from the oven and let cool for 10 minutes before garnishing with fresh basil, slicing and serving. Your bucket list of recipes sounds SO good, Rachel! I can’t wait to see the mozzarella and kombucha! This savory tart looks delicious. I love the spinach and artichoke combo. Sounds so flavorful and perfect for summer! Thanks so much, Gayle! I’m getting giddy and excited about the bucket list, haha. This galette looks just perfect! 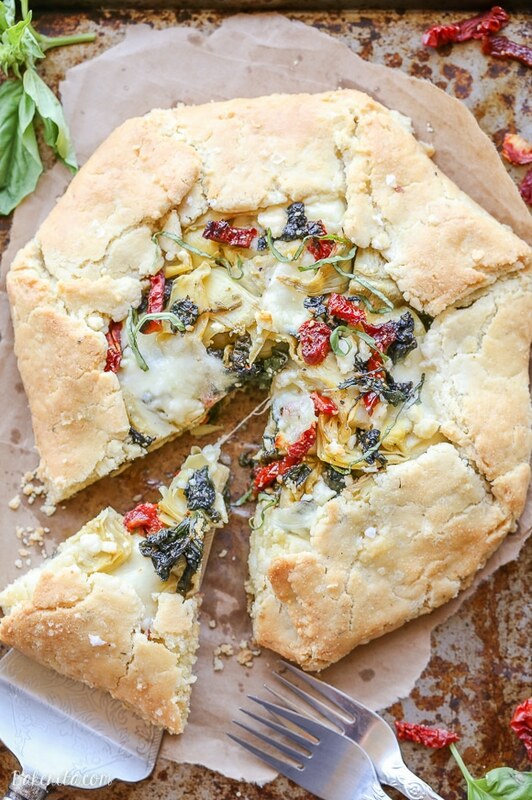 I am all about savory baked goods, especially when there’s plenty of cheese involved. Haha cheese makes everything better! Thanks, Becky. It’s lots of fun – you should make one!! Thanks so much, Danielle. This looks absolutely divine Rachel!! I’m in love with Mediterranean flavours this time of year – add a little heat and some wine and I’m in! I am allll about the savory baking – so I say bring it on!! 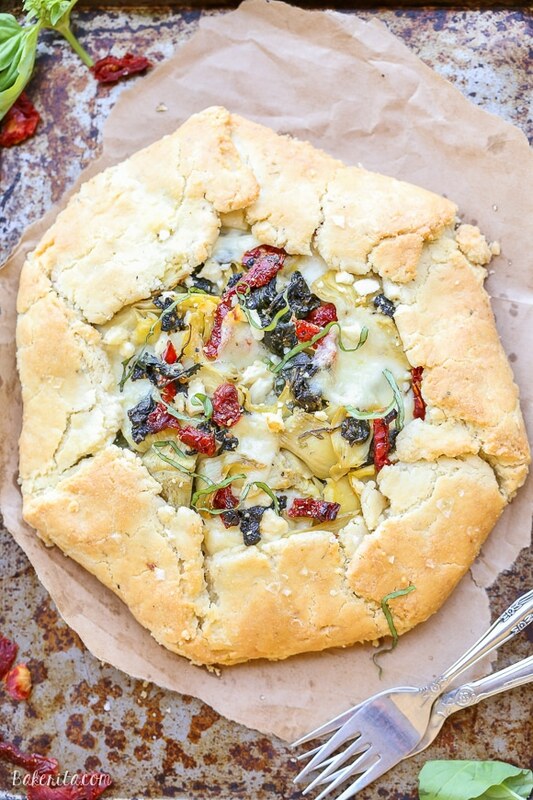 This galette sounds completely fantastic! I love Mediterranean flavors! I also love the idea of a food bucket list. I swear I started one years ago but then I just sorta forgot about it. I must resurrect it! This is making my mouth water! 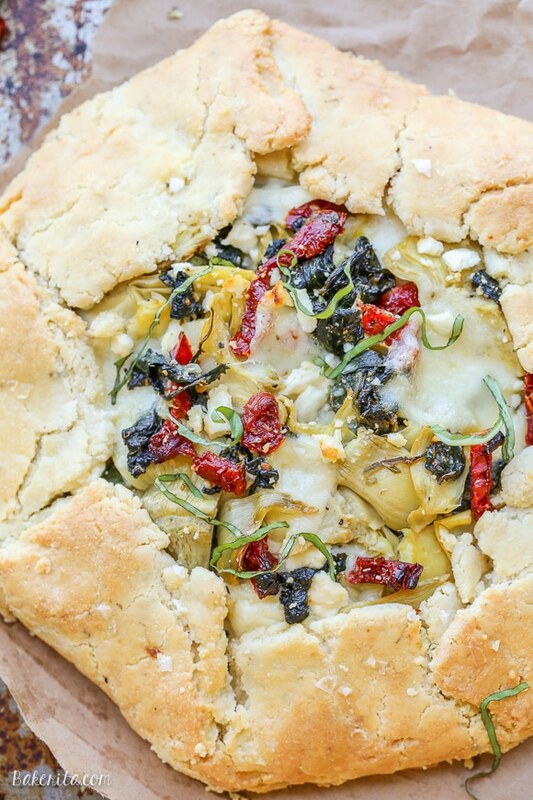 I wish I had a slice for dinner, artichokes with feta are one of my favorites pairings. Take care. It looks delicious! Also, I’m excited to see all of those recipes coming soon. Sourdough bread- YUM! Your bucket list sounds great, Rachel, and I’m so jealous you’re going to Greece! I went years ago and the food was so incredible! 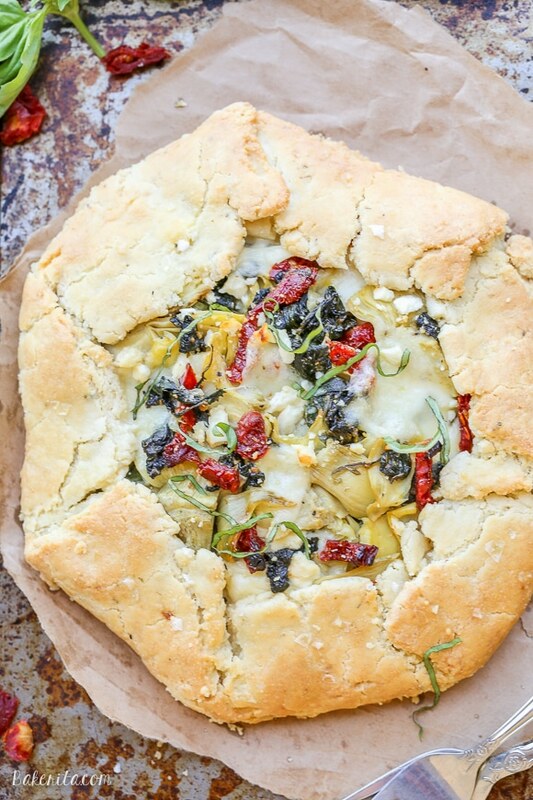 This galette looks seriously delicious with all the Mediterranean love going on — wish I had a slice for dinner! I love this recipe; it looks so delicious! The galette looks fantastic! I wish I could have a bite of it right now. Soo I don’t eat dairy anymore but I’m SO tempted with this galette! And yes yes yes to a kombucha recipe!!! Have a great trip! Oh my. This is so gorgeous and looks so delicious. I may or may not be obsessively figuring out when I can fit this into the weeknight dinner schedule. Looks amazing! I can’t wait to see more of your savory baking!!! This is incredible!! Mediterranean flavors are the best! Your galette looks perfect! All of my favorite flavors all wrapped up into 1 delicious galette. I simply CANNOT wait to make this!!! Just made for lunch….OMG! Thank you for a great recipe! So glad you enjoyed it, Marie! This was delicious and perfect! Stuffed it with rainbow chard, shallots and mushrooms… Gruyere and a bit of cottage cheese, so good. Will be trying this crust again as a topping for shepherds pie! So glad you enjoyed it, Amber!! This recipe looks absolutely yummy and I would l o v e to try it…. however, I’m on Low Carb so the Tapioca Flour is a big no-no. Do you know of any way to sub that? If it is used for the “starchyness”(is that even a word?) I can say I have no problem with gluten and could use gluten flour if that would help. Would love to hear your take on this because I run into Tapioca Flour a lot in grain free recipes. Hi Guinan, tapioca is used to help hold things together because it’s finer than almond flour. You could probably just use extra almond flour and it would likely be fine, or sub in all purpose flour for it if gluten isn’t an issue – having the gluten in there would probably make the crust easier to work with too. Hope you enjoy it! ‘fraid not, it’s the Wheat Flour (carbs) I started out avoiding. But you h a v e given me a flashbulb. I’ll try using Carbalose (LC Carbquick) and add a Tbs or 2 of Wheat Gluten. That might just do the trick! So stupid of me *smacks forhead* to not see the obvious! Thanks for the jolt! Oh I see! Glad you figured out a solution, I hope it works out well :) enjoy!